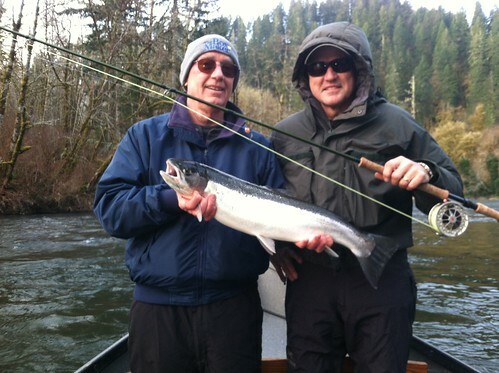 Earlier in the week I was fishing with my good friend Brandon Bischoff and his guest, Dar Isensee. We were lucky enough to run into a fish that we had all been seeking for years. 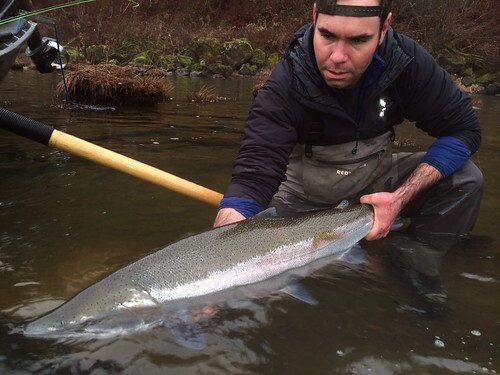 Brandon and I have devoted much of our adult lives to steelhead fishing, and this buck was the biggest either of us had ever seen in person, taping out at 40″ length and 20″ girth. A magnificent creature to say the least. I wonder where he’s swimming around right now? 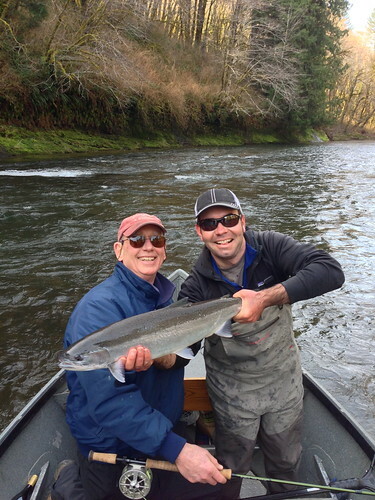 Winter Steelhead Season is off to a Great Start! 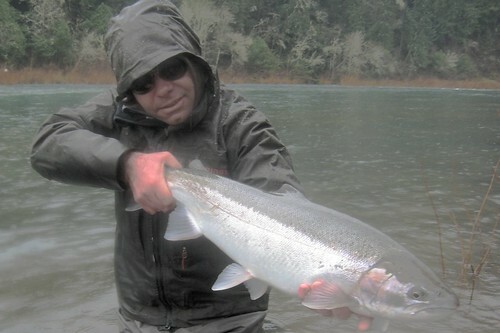 Though we have been experiencing a remarkable late fall and early winter drought, and weather ranging from pleasant to cold to downright arctic, the 2013/2014 winter steelhead season is off to a great start. 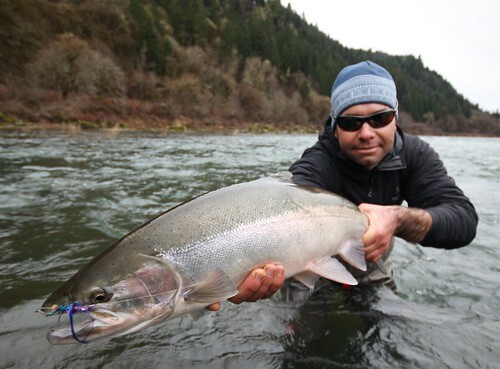 Because flows on are rivers are so low there are fewer places to fish than usual, but the lower reaches of many of Oregon’s coastal rivers have already seen a healthy return of winter steelhead. This is just the vanguard of the run; we should see a lot more to coming over the next several months. Standard swing and nymph tactics have been working well in the right water. The forecast shows a good deal of precipitation headed our way in the first week of the New Year. Hopefully this much-needed weather will actually materialize, bringing us a nice spike in water levels throughout the coastal rivers. 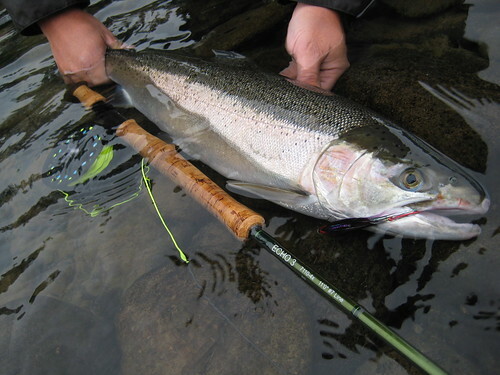 This would allow much better upstream passage for the fish already in fresh water, draw a nice group of fresh steelhead into creeks and rivers along the coast, and bring a lot more of our rivers into fishable shape. 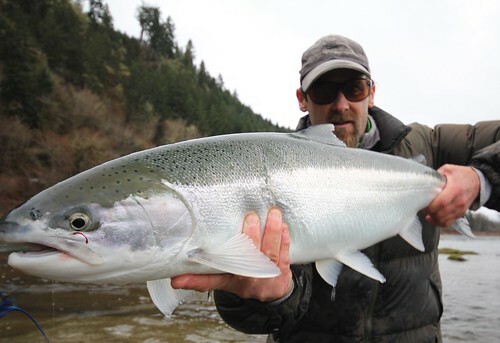 Winter steelhead season is arguably the most exciting fishing of the year in western Oregon, and if early returns are any indication, there will be a lot more fish showing up in our coastal rivers over the next several months. 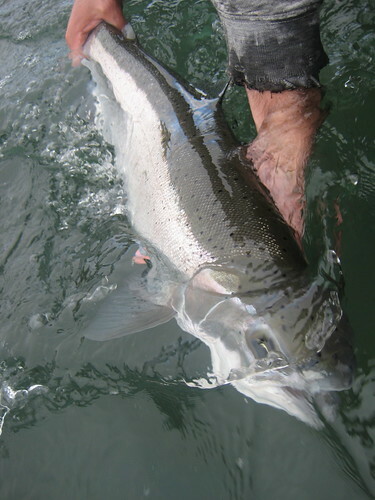 I have quite a few days booked over the coming weeks, but plenty of room open on the calendar at this point throughout winter steelhead season. Please call or email if you are interested in booking a day of fishing this winter. Let’s get out and chase some chrome! 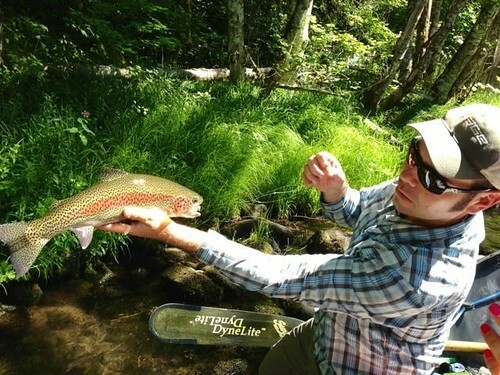 Special thanks to Matt Ramsey for sending along some images from our recent fishing trip. 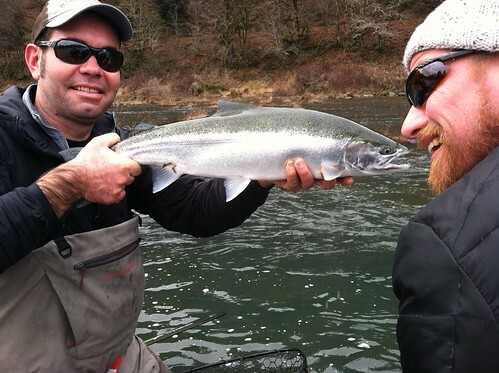 Who’s Excited For Winter Steelhead Season? 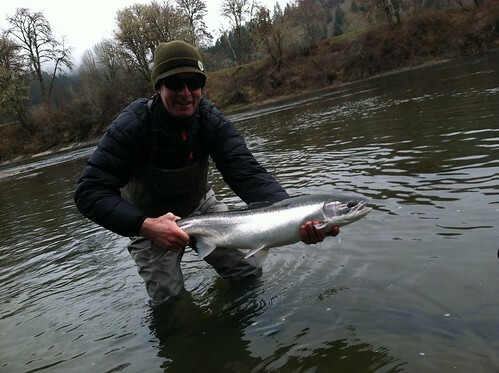 Now is a great time to book winter steelhead trips. 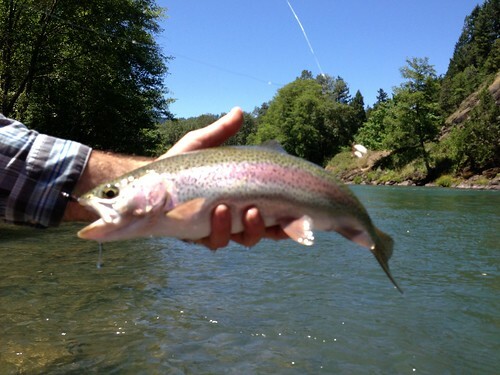 Though it is true that the dog days of summer don’t produce the most prolific hatches of the year, fishing has been good throughout the summer on the wild upper section of the McKenzie River as well as the Middle Fork Willamette between Hills Creek Dam and Black Canyon campground. 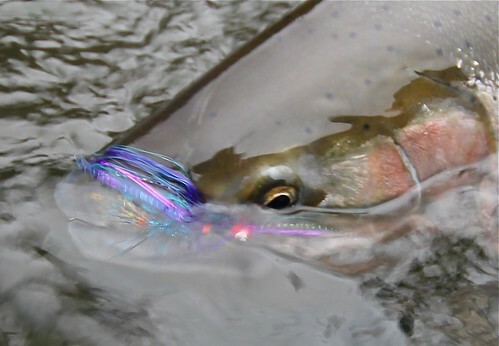 Fishing pressure has been light on these stretches, with the fish responding surprisingly well to large attractor dry flies and dropper nymphs. 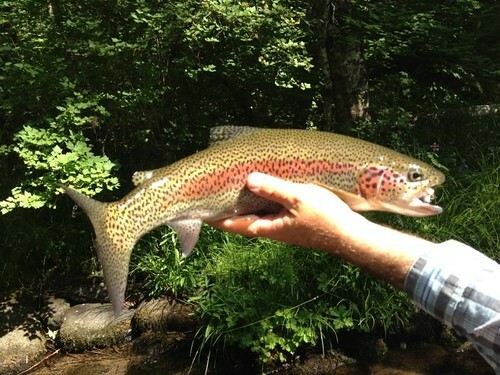 This oversize wild rainbow came out of 10 feet of clear water to attack the Chubby Chernobyl. It ate the fly so aggressively, you can only see a little bit of wing poking out of its mouth in the photo. 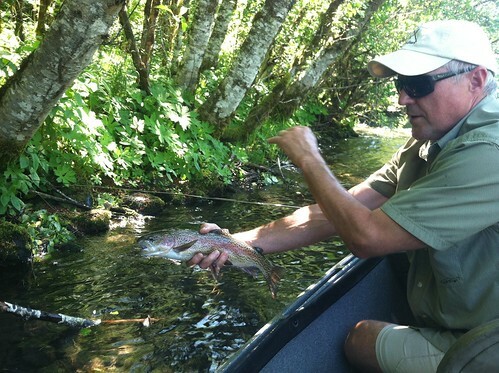 The bull trout pictured here attacked a smaller trout my guest had hooked in a deep pool. 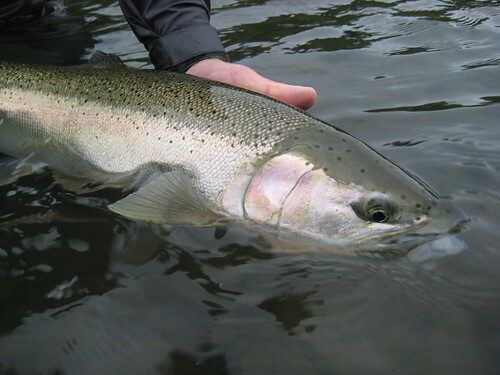 I don’t know what happened to the little rainbow that appeared to be about 10 or 11 inches; whether it ended up in the bull trout’s belly, or was somehow knocked off the hook and escaped. 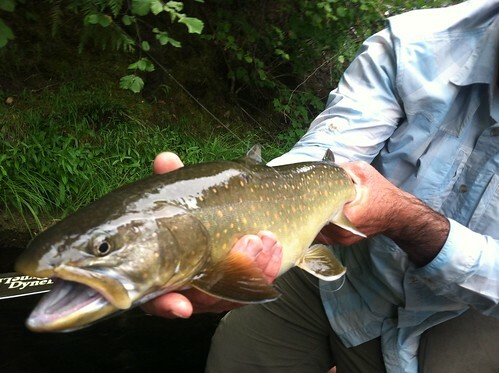 When we landed the bull it was fair hooked on the same prince nymph the smaller trout had eated initially. It was a strange and exciting encounter. Hatches will intensify and fishing will only get better as we move into September with somewhat cooler weather and more cloudy days. Soon, short-winged stoneflies will start to emerge and join October Caddis, some Fall Drakes, and other assorted caddises on the menu. 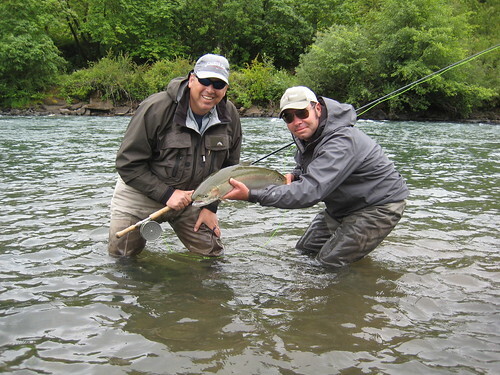 Fall is one of the best times of year to fish for trout on the McKenzie and Willamette, and without a doubt the most productive time to flyfish for steelhead in our Willamette Valley rivers. Now is the time to book fall fishing dates. Don’t miss out on some of the best fishing of the year! 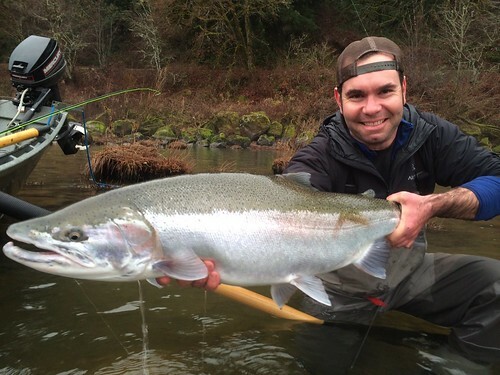 Though the numbers of fish over Willamette Falls to date are lackluster in comparison to the last couple of seasons, summer steelhead fishing in the southern Willamette valley has been improving with more fish on the way and ideal water conditions for swinging flies. 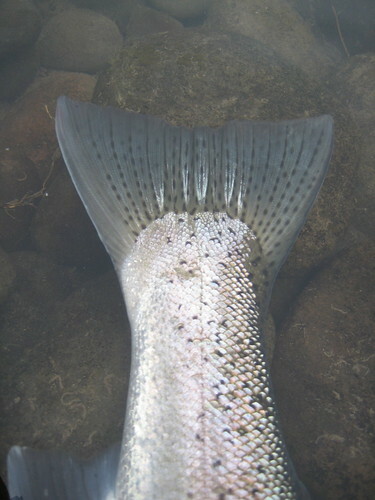 Water conditions on area streams are low and clear. Various patterns ranging from traditional wet flies fished on floating lines to leeches swung deep on tips have been producing fish. 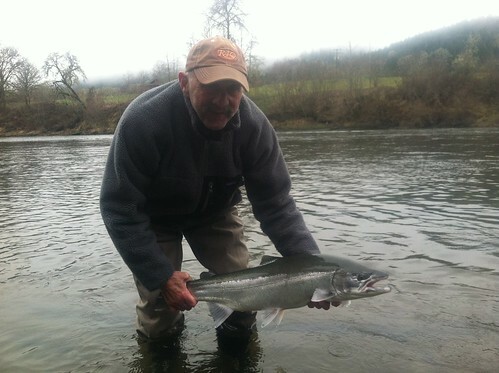 We are blessed with a long summer steelhead season here in the Eugene area, starting in the late spring and extending well into November. 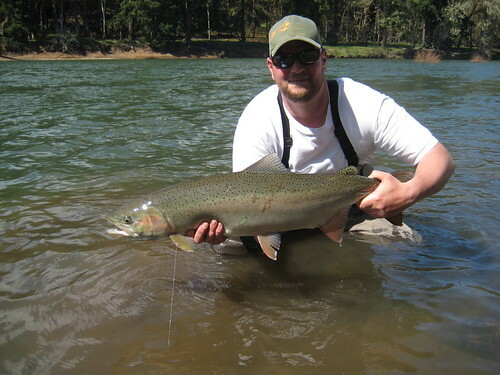 Anyone interested in booking a summer steelhead trip, please call or email! 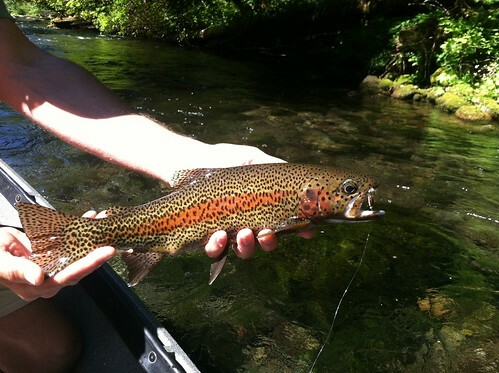 Lower McKenzie Trout Fishing Report: Great March Brown Hatches and Good Fishing! 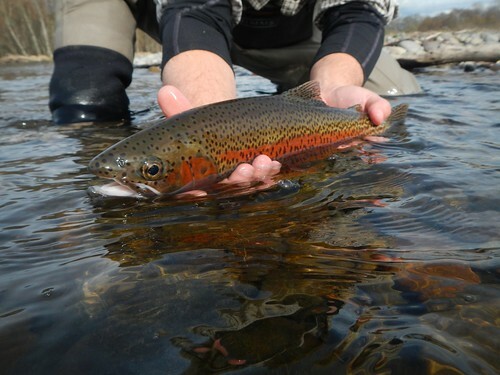 This spring, for the first year in many, we have had light precipitation and consistently low and very fishable water conditions. As of this writing, we are finally getting a good rainfall, and the river has come up, but is still in fine shape. 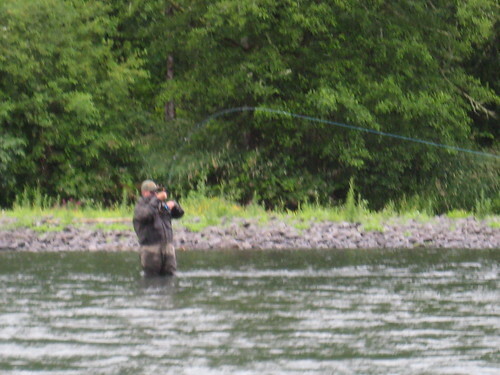 The lower McKenzie can fish well at a wide range of water levels, and current conditions are not high, but only moderate. If anything, this modest spike in water levels will serve to move the fish around, give them a little bit of a break from angling pressure, and reshuffle the deck. Nymphs have still been taking a lot of nice fish both early and late in the day, but over the last couple of weeks, we have seen a lot of great afternoon hatches of March Browns as well as grannom caddis, with good numbers of nice fish looking up. Swung wet fly emergers and dry flies have been getting a lot of attention from the wild redsides and cutthroats of the lower McKenzie. 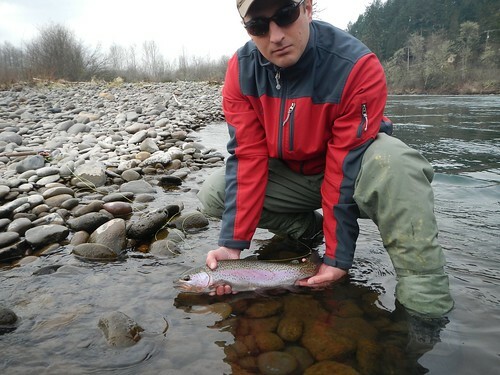 The spring season offers some of the best hatches and trout fishing of the year on the McKenzie. 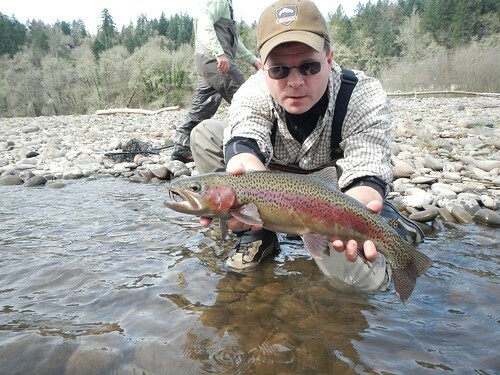 Now is a great time to get out and see what the lower river has to offer. 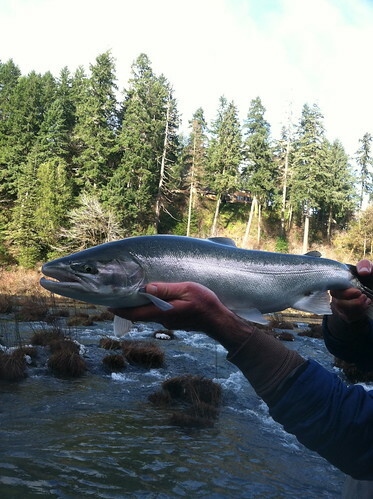 2013 Winter Steelhead Season: Good to the Last Drop! 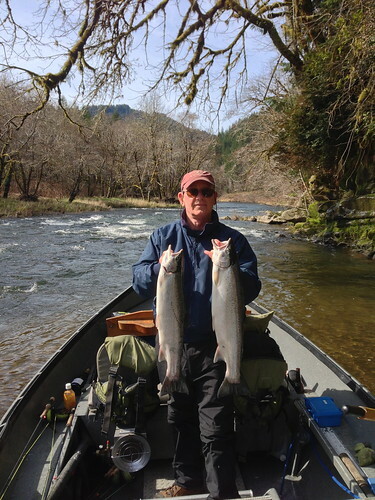 It was a great winter steelhead season throughout the central coast. 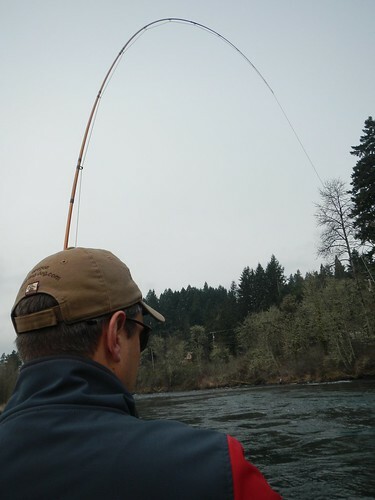 Good fishing persists in some drainages that are still open, though the run is past its peak most everywhere, and many of the coastal systems are closed for the year. 2013 was an exceptional year. We had very light precipitation, no real blow-outs since December, and particularly of late, unseasonably pleasant weather. 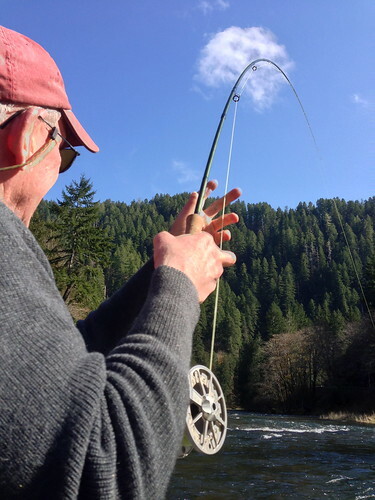 If these trends persist, we very well may have a drought on our hands this summer, but has been nice to worry about preventing sunburns rather than maintaining contact with fingers and toes while winter steelhead fishing. I am already looking forward to next season! Here are a few pictures from recent trips.